There are two types of exceptions in Java, namely, checked exceptions and unchecked exceptions. It is also important to know what is the need of handling the exceptions in our daily development. But at present Let’s examine both these types of exceptions and then identify their differences. Checked exceptions are exceptions that a program is supposed to catch and handle. A checked exception is declared in the source code and indicates the possibility of an exceptional condition that might occur within a block of code. Checked exceptions are validated by the compiler at compile time. Therefore, these exceptions must conform to the catch or specify requirement. This means that a checked exception must be specified either in a try/catch block or in a method’s throws clause. One way of declaring checked exceptions in source code is by specifying the program statements you need to monitor within a try/catch block. The exceptions thrown from the try block are handled by the catch block. The following program reads a file and displays its contents. This program illustrates the use of try/catch blocks to specify checked exceptions. In this program, checked exceptions are specified in three places using the try/catch blocks. In the first try/catch block, there is a possibility of an error when the specified filename is not found. This situation throws a FileNotFoundException that is handled by the catch block. The second try/catch block handles a situation in which an IO error occurs while reading the file and the third try/catch block handles a situation in which the file cannot be closed. In this way, the three possible exceptions that might occur in the program are checked and handled using try/catch blocks. The second way of declaring checked exceptions in source code is by specifying the throws clause in a method’s declaration. When a method does not handle an exception it throws, you must specify the exception using a throws clause in the method’s declaration. If a method uses a throws clause, the checked exception is thrown out of the method. The following code illustrates the use of the throws clause to specify checked exceptions. Though there is a possibility of an IOException occurring within this code, the method does not handle the exception. Therefore, the throws clause is used to specify a checked exception so that invoking methods can handle that exception. Unchecked exceptions are the exceptions that a program does not catch and handle. These exceptions are not validated by the compiler but are identified by the Java run-time system. The compiler does not check whether a method throws or handles an unchecked exception. Therefore, unchecked exceptions are not included in a try/catch block or specified in the throws clause of a method. Unchecked exceptions are errors that violate Java’s rules or the run-time environment’s constraints. There are two kinds of unchecked exceptions, namely, error and run time exception. Errors are exceptions that occur in the run-time system and are outside the scope of the program. These exceptions throw IOError and cannot be resolved by the program. Some examples of errors are hardware or system malfunction, and stack overflow. RuntimeException is a subclass of the Exception class. It includes exceptions that occur due to logic errors or bugs in a program. Run time exceptions are not handled by the program but are identified by the Java run-time system when the program executes. Some examples of run time exceptions are division by zero and null pointer. 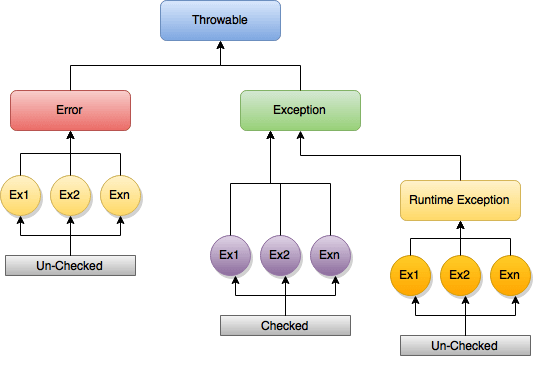 Checked exceptions are checked by the compiler whereas unchecked exceptions are not checked by the compiler. Checked exceptions must be specified in a try/catch block or using the throws clause whereas unchecked exceptions are not specified in the program. Checked exceptions can cause compilation error if their specification is incorrect whereas unchecked exceptions do not cause compilation error. Checked exceptions are handled by an exception handler in the program whereas unchecked exceptions are handled by the Java run-time system. Checked exceptions have a possibility of recovery allowing the program to continue whereas unchecked exceptions result in program termination. The main difference between checked and unchecked exception is that the checked exceptions are checked at compile-time while unchecked exceptions are checked at runtime. Thanks for sharing this.